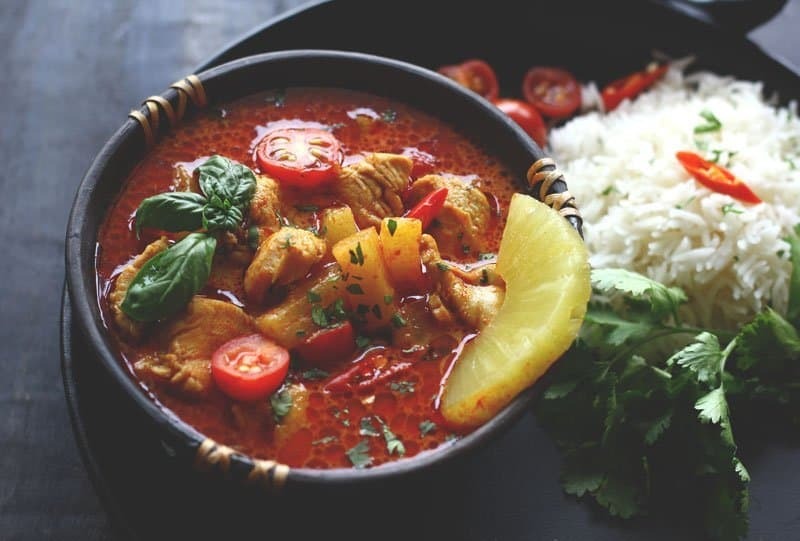 Who doesn’t love a good Thai Red Curry? I personally adore it to the core. That is the reason a bottle of homemade Thai curry paste is always sitting in my fridge. So this time I combined pineapple and red curry paste and chicken to make Thai Pineapple Chicken Curry. And it was super delicious. The tanginess and juiciness of the fruit perfectly complimented the spiciness and boldness of the curry perfectly. Pineapple Chicken Curry has become one of my recent Friday night dinner favorite. With red curry paste in hand, the entire dish is on the table in 30 minutes. This Thai Pineapple Chicken Curry is one of the tastiest things that happened in my kitchen recently. There are no words. It has the perfect, bright red color and the spicy, soupy sauce. I think I should try more savory recipes with pineapple. After the grilled pineapple salad, this curry with pineapple totally blew me away with its flavors. There’s no denying that a made-from-scratch curry paste makes a difference. But you know what? You can use the store-bought curry paste as well to make it in a hurry. Just nicely saute the store bought curry paste before adding the chicken. 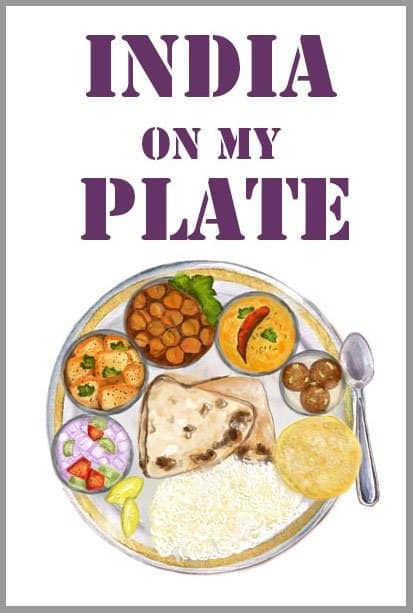 A pack of 50 gram is sufficient to make the flavorsome curry for 4 – 5 people. My homemade red curry paste is a little bit on a robust flavor side. So I use it cautiously to get the balanced flavors in a curry. Why I make the red curry paste in large batches? Because we often do Thai curry for dinner. So it makes sense to always have a jar full of curry paste handy. Talking about the pineapples, you can use the canned pineapple tidbits as well. But those are a bit sweet in taste so avoid adding any sugar in the curry. And if you are using the fresh pineapple for the curry add it towards the end and don’t cook it for too long. 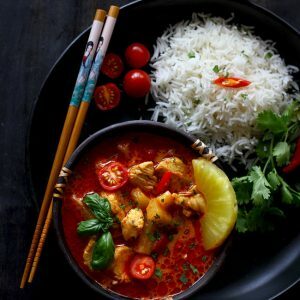 With these tips, I am sure you will be able to make an awesome Pineapple Chicken Curry with the spot on flavors. Pineapple Chicken Curry has become one of my recent Friday night dinner favorite. 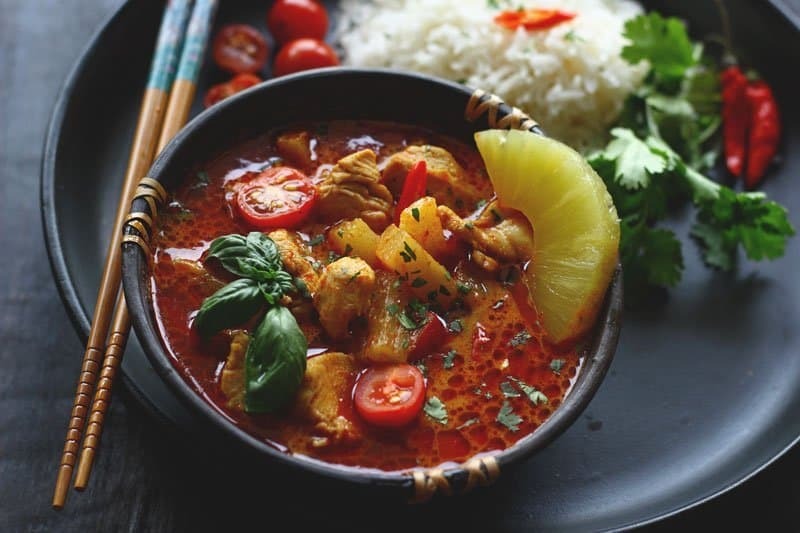 Find how to make Thai pineapple chicken curry. In a large wok heat the oil. Add the chicken and cook till it turns white. This takes less than 5 minutes. Next, add the curry paste stir to combine with the chicken. Then add the chicken stock, sugar, fish sauce. red chili and salt. Stir to combine and simmer over low heat for 10 minutes. Add the coconut milk and stir. The coconut milk is added toward the end to prevent curdling. Once the chicken is almost cooked add the pineapple cubes and kaffir lime leaves. Cook for a minute and then turn off the heat. Garnish with fresh basil leaves and drizzle lemon juice (if using) before serving. 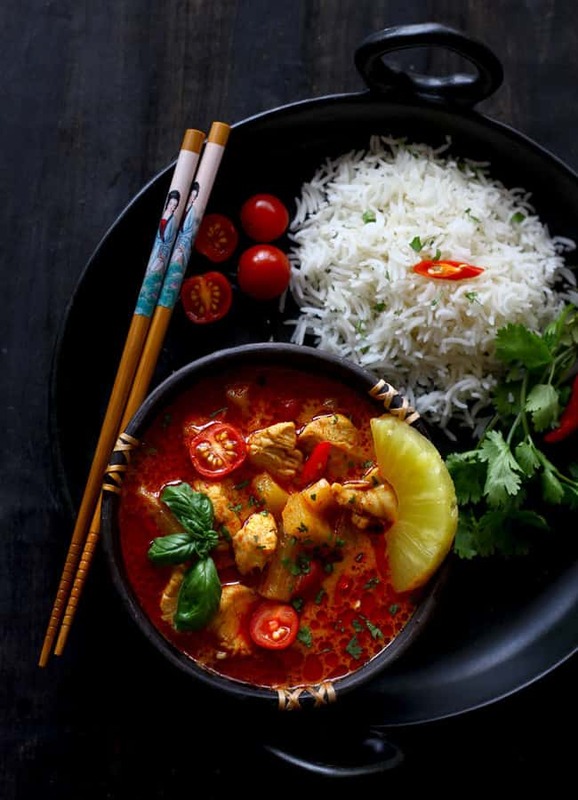 Serve Thai Pineapple Chicken Curry warm with steamed jasmine rice.